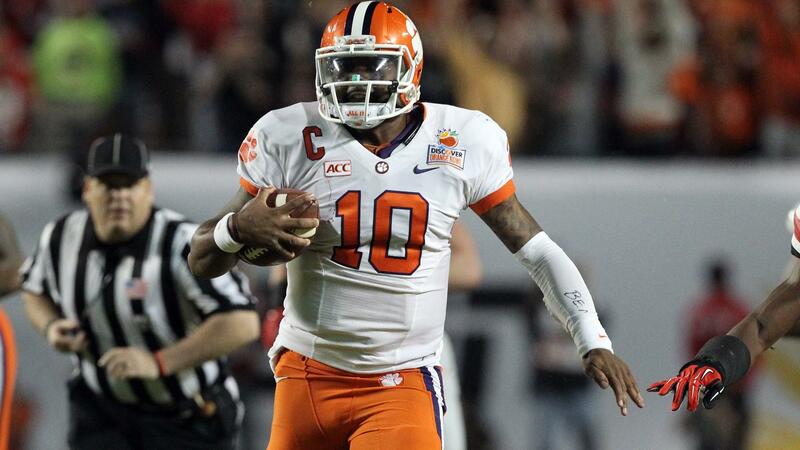 CHICAGO, IL – Clemson University quarterback Tajh Boyd will participate in the 2014 Quicken Loans All-Star Football Challenge, an exciting skills competition featuring college football’s brightest stars. The 16th annual program is scheduled to air Tuesday, Jan. 28, at 9 p.m. ET on ESPN2 and will have an encore airing on ESPN2 at 2 p.m. ET on Feb. 2. ESPN will also air an encore at 4 p.m. ET on April 27. Individual events in the 2014 Quicken Loans All-Star Football Challenge include: Quicken Loans QB Accuracy, Skechers Hands Competition, Mercedes-Benz Lineman Strength Challenge, Eckrich Obstacle Course and TD Ameritrade Speed Kick. To conclude the program, the players will be divided into three teams for The Quicken Loans Team Competition. Boyd concluded his playing career as one of the most prolific passers in Atlantic Coast Conference history. The two-time First Team All-ACC selection threw for a conference-record 107 touchdowns and accounted for a league-best 133 scores during his career. Over 47 games with the Tigers, Boyd threw for 11,904 yards and 107 TD’s and posted 12 of the top 14 single-game passing-yardage totals in Clemson history. A finalist for both the Manning and Johnny Unitas Golden Arm Awards, Boyd was responsible for 44 touchdowns and totaled 4,251 total yards in 2013. The participants in the 2014 Quicken Loans All-Star Football Challenge are: Quicken Loans QB AccuracyTajh Boyd – ClemsonDavid Fales – San Jose StateLogan Thomas – Virginia Tech Eckrich Obstacle CourseLache Seastrunk – RB – BaylorCJ Mosley – LB – AlabamaKyle Van Noy – LB – BYUSkechers Hands Competition Ha Ha Clinton-Dix – S – AlabamaJustin Gilbert – CB – Oklahoma StateMarcus Roberson – CB – FloridaBradley Roby – CB – Ohio StateMercedes-Benz Lineman Strength ChallengeRa’Shede Hageman – DL – MinnesotaJake Matthews – OL – Texas A&MLouis Nix III – DL – Notre DameTD Ameritrade Speed KickChris Boswell – RiceAnthony Fera – TexasCairo Santos – TulaneAlumni of the All-Star Football Challenge include three Heisman Trophy winners (Ron Dayne, Troy Smith and Jason White) and 52 first-round NFL draft picks, such as: Drew Brees, Aaron Rodgers, Santana Moss, Matt Ryan, Von Miller Vernon Davis, Joe Flacco, Donovan McNabb, EJ Manuel, Kenny Vaccaro, and Edgerrin James.For more information on the 2014 All-Star Football Challenge, follow us on Twitter (@AllStarFBall) and like our Facebook page (https://www.facebook.com/AllStarFootball).